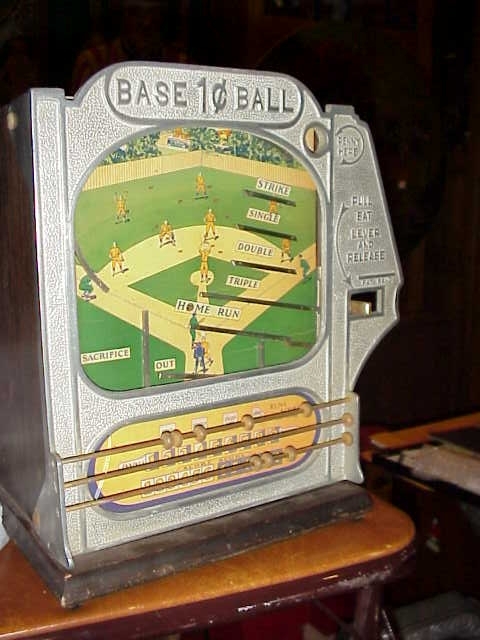 Atlas Indicator Works Penny Base Ball game room machine. Circa 1931 art deco coin op game that keeps each home run in a verifier window until an over-the-counter reward is paid out. 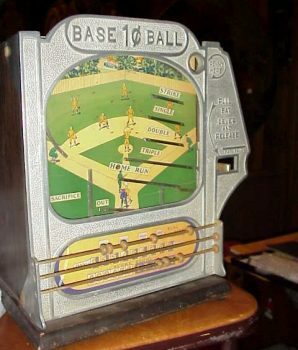 The game is played by inserting a penny into an upper right corner opening and pulling a “baseball bat” lever, which launches the penny onto the playing field. The penny lands in one of seven chutes: single, double, triple, home run, strike, sacrifice, or out. A base hit or strike keeps the penny in play; a sacrifice or out loses the penny. Situated below the “play field” are three metal bars with sliding metal beads used to record runs scored, innings, scores, and outs. A lever on the right side of the machine can be can be turned up on the home run chute, allowing the proprietor to view the winning amount before giving out the prize. The “playing field” retains its colorful graphic design. Lock and Key. Excellent condition with minor wear commensurate with age. The marquees is recast from original as they are very rare to find. 13-1/4″ x 12″ x 8″.